On Sept. 4, 2005 — nearly a week after floodwaters submerged much of the city, a call came in to the New Orleans Police Department: Officers in distress, maybe under fire, at the Danziger Bridge. But when the first officers arrived, they were the ones who ended up shooting at a group of unarmed people. One of those people was Susan Bartholomew. "When I looked we were all on the ground and all you could see is blood, you know, everywhere," she told NPR in 2006. "And everybody's just hollering and moaning, you know, everyone had been shot and in pain. I look over, my right arm was on the ground, like, lying next to me. It had been shot off." Bartholomew and other victims challenged the police account of that day — an account that eventually fell apart. By 2013, five officers had been convicted in connection with the case. And yet, it's still not over — news broke late today that a federal appeals court has agreed that the five officers convicted in the shootings are entitled to a new trial. The facts of the shooting remain the same, but the 5th U-S Circuit Court of Appeals upheld the ruling by District Court Judge Kurt Englehart, who said Justice Department staff compromised the case by posting anonymous comments about police on online news articles. Ronnie Greene is the author of the book Shots on the Bridge. He tells NPR's Audie Cornish that Susan Bartholomew and her family were one of two families on the bridge that day. "Both were just trying to survive Katrina. ... [Bartholomew's family] had found refuge in some really decrepit hotel rooms right off Danziger Bridge. After the storm, they were walking over the bridge to buy medical supplies, and to buy some cleaning supplies. The other family involved was the Madison family — it was brothers Lance and Ronald Madison, who had stayed back with the storm coming, because Ronald did not want to leave the family pets. And this day, this morning, they had been trying to walk home." Apparently earlier that morning there had been a couple of people with guns, firing, and that's what prompted the 108 call. The officers stormed to the bridge in a Budget rental truck. It speaks, I think in some measure, to the unprecedented craziness of these times. No one can say what the officers did was right that morning, there's no question. You can't shoot first, and then ask questions. I'm not even sure they asked questions. There was very much a sense in the police department, "us versus them," because the officers had spent their days either rescuing people or arresting people. And one of their colleagues had just been shot in the head a couple of days earlier for stopping to pat down people walking through one part of town. They were way beyond high alert. They had their own weaponry — the driver of the truck had his own 30-inch AK-47 that he wedged in the seats every day going out. And I think that in some way speaks to the chaos of the times. It started immediately. The cover-up began before the victims were even rushed to the hospital ... right on the bridge, while there were bodies around them, the blood was all around them, there was already discussions about planting a gun. There were already discussions that this case should be closed. And ultimately, what the defense argued was, "we feel this was part of a larger plan to convict the officers before they went into court," and the trial judge in this case, Kurt Englehart, vacated the jury verdict and directed for a new trial, in large measure because of those issues. At a time when the entire country is looking at police conduct, and police shootings, and actions involving unarmed people, this is such a striking and meaningful case study. First off, were it not for the residents pushing for the truth, pushing past the police wall of lies, the truth — I don't think — would have ever come out in this case. And it was prompted by the residents pushing to get answers, and filing lawsuits that created a whole new narrative on what was being portrayed here. And I think that that's telling — that the department's fiction would have held, were it not for the residents' really, really pushing. I think it raises real questions about, also, the supervision and the direction over which departments operate. In this case, it seems clear that the officers who were on the bridge, and the supervisors who helped them create — and I use the word create, because they created a fiction, their cover-up was a fiction — they did not seem to be worried about what the mayor or the bosses above them would be doing. And I think that speaks to the kind of culture you need not to have in a local department. On September 4, 2005, nearly a week after floodwaters submerged much of the city, a call came into the New Orleans Police Department. 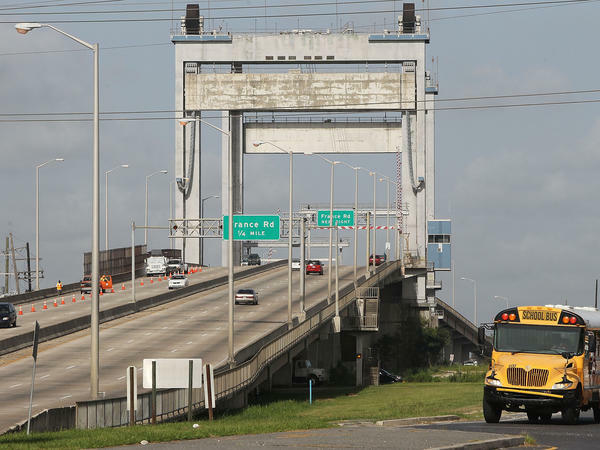 Officers under distress, under fire, they thought, at the Danziger Bridge. But when police arrived on the scene, they were the ones who ended up shooting at a group of unarmed people. One of those people was Susan Bartholomew. SUSAN BARTHOLOMEW: When I looked, we were all on the ground and all you could see is blood, you know, everywhere and everybody's just hollering and moaning. You know, everyone had been shot and in pain. I look over, my right arm was on the ground, like, lying next to me. It had been shot off. CORNISH: That was Bartholomew speaking to NPR back in 2006 after she and other victims challenged the police account, an account that eventually fell apart. By 2013, five officers were convicted in connection with the case. And yet, it's still not over. To talk about why is Ronnie Greene; he's the author of the book "Shots On The Bridge." Welcome to the program. RONNIE GREENE: Thanks for having me. CORNISH: So Susan Bartholomew - how did she and her family end up on the bridge that day? GREENE: Essentially, there were two families on the bridge that day and both were just trying to survive Katrina. Susan was there with her husband, their two oldest children, their nephew Jose Holmes and his good friend J.J. Barset (ph). And they had found refuge in some really decrepit hotel rooms right off the Danziger Bridge. After the storm, they were walking over the bridge to buy medical supplies and to buy some cleaning supplies. The other family involved was the Madison family. It was brothers Lance and Ronald Madison who had stayed back with the storm coming because Ronald did not want to leave the family pets. In this day, this morning, they had been trying to walk home to the family home in East New Orleans, get on bikes and pedal away. They couldn't get there, so they were then walking back over the bridge. So the Bartholomew family and the Madison family were brought together at this moment. CORNISH: So they're on that bridge right at the moment that police are racing to the bridge because they've heard a call - a 108 call - officer under distress. GREENE: That's exactly right. And apparently, earlier that morning, there had been a couple of people with guns firing, and that's what prompted the 108 call. The officers stormed to the bridge in a Budget rental truck. Two officers are in front, nine are in the cargo area in back; back doors are open so that officers in back can see what's behind them but not what's ahead. The officers pull up to the bridge and one of the officers reached out with his handgun. He drove with one hand and fired with the other, and they started firing shots before they even came to a complete stop. CORNISH: And what you're describing sounds like something out of a movie. GREENE: That's right. And it speaks, I think in some measure, to the unprecedented craziness of these times. No one can say what the officers did was right that morning. There's no question. You can't shoot first and then ask questions. I'm not even sure they asked questions. But the insanity of Katrina was factoring into this where the officers began shooting before the truck came to a complete stop. And the families, they started scattering on the bridge, and that was the beginning of this bloodshed that killed two and maimed four. CORNISH: When you look back at that period, remind us about what we mean by chaos. I mean, you had the mayor and the police chief, right, out there saying that things were violent and chaotic on the streets. GREENE: There was very much a sense in the police department of us versus them because the officers had spent their days either rescuing people or arresting people. And one of their colleagues had just been shot in the head a couple of days earlier for stopping to pat down people walking through one part of town. They were way beyond high alert. They had their own weaponry. The driver of the truck had his own 30-inch AK-47 that he wedged in the seats every day going out. And I think that, in some ways, speaks to the chaos of the times. CORNISH: How soon did the cover-up start? GREENE: It started up immediately. The cover-up began before the victims were even rushed to the hospital - the surviving victims - for treatment. Right on the bridge, while there were bodies around them and the blood was all around them, there was already discussions about planting a gun. There were already discussions that this case should be closed, that necessary action was taken. The cover-up began instantly. CORNISH: The police report filed weeks later was hatched after multiple rewrites with invented witnesses and a planted gun. That report held up in a first trial at the state level, but prosecutorial misconduct led a district judge to dismiss the case in 2008. Supporters argue the officers had been heroes, staying to protect the city while others fled. But then, Ronnie Greene says, the Justice Department's civil rights division stepped in and took a closer look. GREENE: Four years after the shootings on the bridge, they shut down the bridge searching for evidence. Then they started knocking on doors of officers. They also knocked on doors of a lot of the witnesses who had not been questioned before in the earlier case. And the accumulation, I think, of this evidence gave them the power to convince these officers that that was the thing to do. And several of the officers did just that. They crossed that blue line and they testified. CORNISH: Eventually, federal investigators are successful, right, and federal prosecutors are successful. They get five of the officers convicted - four for the shooting and one for the cover-up. And yet, this case isn't really seen as a success, in part because of behavior of some of the prosecutors in the U.S. attorney's office that ended up jeopardizing the case even now. It's a strange one what happened here. Can you explain it? GREENE: There was a prosecutor and then found out another prosecutor who were filing anonymous comments on any local story in the Times-Picayune about police misconduct, including Danziger and others. CORNISH: So they were Internet commenters (laughter), right, writing about stories on a case that they were working on. They would rail against the police department in the comment sections of news articles. GREENE: They would rail against the police department in any sort of case in the news - a couple of them. And ultimately what the defense argued was we feel this was part of a larger plan to convict the officers before they went into court. And the trial judge in this case, Kurt Engelhardt, vacated the jury verdict and directed for a new trial in large measure because of those issues. CORNISH: A new trial - so what's the status right now? What does this mean for these families? GREENE: Well, the Department of Justice has appealed that and argues - has argued that those comments had nothing to do with what happened on the bridge that morning - absolutely nothing to do - and had no impact on justice. And so everyone's been waiting to see what the appeals court is going to do. The options are follow the judge's directive and order a new trial or keep intact the convictions as they were, and everyone's been waiting for that next step. CORNISH: This case has so many twists and turns. And it sprung out of a singular event, an unusual event. Why does that matter? Why - do you see a kind of broader question here when it comes to this case on the Danziger Bridge? GREENE: At a time when the entire country is looking at police conduct and police shootings and actions involving unarmed people, this is such a striking and meaningful case study. First off, were it not for the residents pushing for the truth, pushing past the police wall of lies, the truth - I don't think - would have ever come out in this case. And it was prompted by the residents pushing to get answers and filing lawsuits that created a whole new narrative on what was being portrayed here. And I think that that's telling, that the department's fiction would have held were it not for the residents really, really pushing. I think it raises real questions about also the supervision and the direction over which departments operate. In this case, it seems clear that the officers who were on the bridge and the supervisors who helped them create - and I use the word create 'cause they created a fiction. Their cover-up was a fiction. They did not seem to be worried about what the mayor or the bosses above them would be doing. And I think that speaks to the kind of culture you need not to have in a local department. Listen, the officers are dealing with life-and-death issues, and certainly after Katrina, profoundly so. There's no question about that. But I think if they know that the people at the top are going to be looking at them if they veer off course and in this case with tragic consequences that they won't so easily be able to get away with telling a story like this. CORNISH: Ronnie Greene - he's the author of "Shots On The Bridge: Police Violence And Cover-up In The Wake Of Katrina." Thank you so much for coming in to speak with us. GREENE: Thanks for having me. Transcript provided by NPR, Copyright NPR.